I am delighted to be featured in this month’s issue of Teach Primary magazine. I have contributed to the publication with a Key Stage 2 Maths lesson plan on measurement. This is quite a hands-on lesson that does require a fair amount of preparation – the results are worth it though! measure, compare, add and subtract masses and lengths. 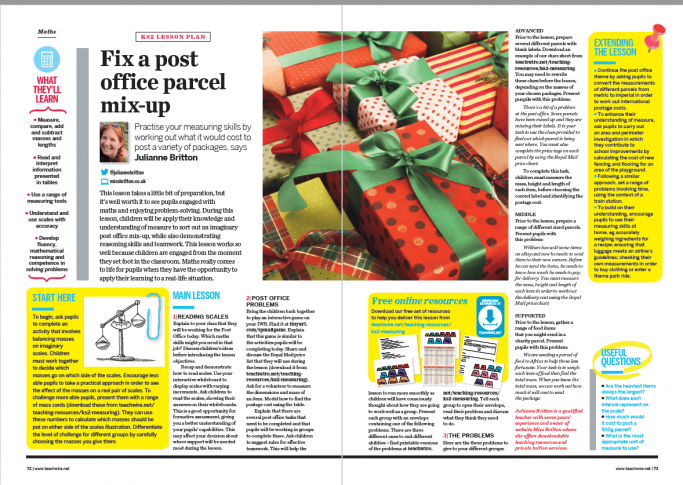 The classroom is a Post Office and there has been a parcel mix up! Children are presented with various parcels and clues. They must measure the dimensions and mass of each parcel accurately in order to work out which label should be attached to which parcel, as well as identifying the total postage cost.